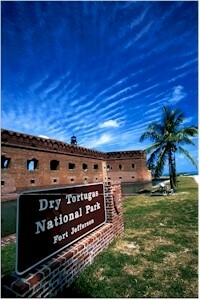 Ponce de Leon discovered the Dry Tortugas in 1513 when he caught over 100 sea turtles there. Subsequently the islands were referred to as the "Tortugas" (turtles). During the 1600s and 1700s the area around these islands was used by pirates as a base for attacking merchant shipping in the Gulf. After the War of 1812 a group of forts from Maine to Texas was envisioned to provide defense for the United States of America. Fort Jefferson was built to protect the southern coastline of the United States and the lifeline of commerce to and from the Mississippi River. The fort was planned to be the greatest of these. 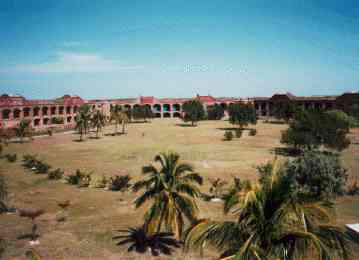 Fort Jefferson itself is a six-sided building constructed of 16 million handmade red bricks. In 1825 a lighthouse was built on Garden Key to provide warning to sailors about the dangers of reefs and shoals surrounding the Dry Tortugas. .Construction of the fort dragged on for more than 30 years, and it was never really finished. Construction of the moat was also an engineering challenge and was not completed until 1873. The invention of the rifled cannon during the Civil War rendered the walls of the fort vulnerable to destruction and made the fort itself somewhat obsolete. During and after the Civil War the fort began to be used as a prison for deserters and other criminals, most notably Dr. Samuel Mudd, who was sentenced to life in prison for his part in President Lincoln's assassination. In 1874 the army completely abandoned the fort after several hurricanes and a yellow fever epidemic, and it wasn't until 1898 that the military returned, in the form of the navy, which used the facilities during the Spanish-American War. The fort was also used from 1888 through 1900 as a quarantine station, and was garrisoned again briefly during World War 1. In 1908 the area was designated as a bird reserve and transferred to the Department of Agriculture. On January 4, 1935, it was designated by President Franklin Roosevelt as Fort Jefferson National Monument, the first marine area to be so promoted. On October 26, 1992, the monument was upgraded to national park status in a bill signed by President George Bush. Ranger-conducted activities - Check the dock's announcement board or the Visitor Center for dates and times of ranger-guided programs. Visitor Center - Information, exhibits, an orientation slide show, and publications are available. The Visitor Center is open daily from 8:00 a.m. to 5:00 p.m.
Touring Fort Jefferson - A 40-minute tour is given by our onboard narrator, or you may take a self-guided walking tour of American's largest 19th century coastal fort. Follow the signs with a Civil War soldier on them. Camping - Camping is available but all supplies, including fresh water, must be brought in. Parties of more than ten must make reservations by writing to the park. For campers, snorkel gear may be rented from the Yankee Freedom II. The national park no longer provides snorkel gear. Please advise the reservationist when making your camping reservation of how many campers will need gear. Due to occasional inclement weather, we can not guarantee return dates. In the event of a cancelled trip, the Yankee Freedom II will return campers on the next trip to the park. Fishing - The dock on Garden Key is a good place to catch saltwater fish. Sportsmen can fish from their own boats offshore. Check with a ranger for specifics. Lobstering is prohibited in the park. Fishing licenses are available in Key West. Snorkeling - Patches of healthy coral reef, some easily accessible from shore and in shallow water, are snorkeling havens. Snorkeling equipment may be borrowed from the Yankee Freedom II. Campers please see the above section for snorkel gear. Bird Watching - The Dry Tortugas are renowned for spring bird migrations and Florida Keys Bird Watching Trips.